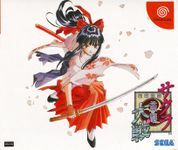 Sakura Taisen, or Sakura Wars, is Oji Horii's blockbuster game, originally for the Sega Saturn. It is a mix of an anime-style story-driven game, a romance adventure and robot mini tactics. The game is set in a fictional 1920s, and the player takes the role of Oogami, a young lieutentant in the army. He is ordered to be the group leader for the Bloom Attack group in the imperial capital. To his extreme disappointment, this group turns out to be a theater troupe of six young women, and Oogami is set to check the tickets of customers. But before long, strange alien-demons attack the capital, and the Bloom Attack Group gear up in their steam-powered robots "Kobu", to defeat evil. Sakura Taisen was a smash-hit and was made into musicals, video animations, TV animations and an animated feature film.